I am originally from Japan. Many dishes that I have eaten here over the years is something that were new to me. I had never tasted Mexican food, I had never tasted Thai food etc..
Years ago, I was working at the Airport for Japanese Airline and one of our co workers was from Thailand. One day, she brought Thai coconut chicken soup and Papaya salad and I got to taste test them and I was hooked with Thai food since. It was very very spicy but it was good. Since I was interested in learning more of Thai food through her, she even took me to ethnic store where I get to see what she would buy to cook her authentic Thai food. That is how I could learn basic flavor combination of her country. I started enjoying cooking Thai food at home since then. One other lady’s husband, who is from Thailand, was working for Thai restaurant, and I got to try variety of Thai food at the restaurant as well. One of my favorite dish is garden roll or sometimes called “Thai spring roll”; salad ingredients and Thai basil and shrimp or ground chicken are wrapped with rice paper and you are to eat it by dipping the roll with Thai peanut sauce. I think it is very refreshing hand feeding friendly salad and I love the flavor of Thai basil. The other day, I made peanut sauce and used it for chicken stir fry, and it came out good. All you need to do is to cook the chicken, set it aside, cook the vegetables you have in the fridge and then,put the chicken back in the skillet. 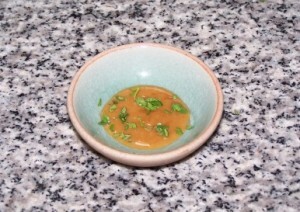 Then, drizzle peanut sauce to coat the ingredients. Then garnish it with toasted coconut flakes with chopped cilantro and serve it with Jasmine rice. The leftover sauce can be used as base sauce for Thai pizza or salad dressing or maybe you can make chicken burger and use the sauce instead of cheese etc. You can find many ways to use one simple sauce. I thought I would share the recipe here with you so you can be creative to make your own peanut sauce anything. I would have sprinkle crushed peanut on top of the sauce but it was out so, I used cilantro only for the garnish. You do not want to overdo the crushed peanuts on top of the Thai peanut sauce or on the dish but a little bit of crushed peanut will give you the nice crunch and it is tasty. 4. Cook it till thicken. Garnish it with chopped cilantro and chopped peanuts.